Trimdon Grange mum-of-four Tina Davidson ignored a broken toe to huff, puff, slip, slide, climb and crawl along a challenging 5km obstacle course at the weekend to help buy a special ‘cuddle cot’ for parents whose babies are ‘born sleeping’. She was supported along the route by her partner, Jon Defty, and three friends – Sharon Greenwood from Trimdon and Hayley and Shaun Lambton from Sherburn Hill who entered the run as ‘Drew’s Crew’ (pictured before setting off). Drew was Tina and Jon’s baby son who died in hospital in August last year at 16 weeks gestation and who triggered the couple’s decision to fund-raise for a cuddle cot, a cooling pad which can be placed in any type of baby bed to allow families of babies who have passed away to grieve before their child is taken away to the mortuary. All five members of the team completed the course and then discovered that with existing funds and pledges from supporters, they had raised the £1600 needed to buy a cot in Drew’s name which will be donated for use by a local undertaker. 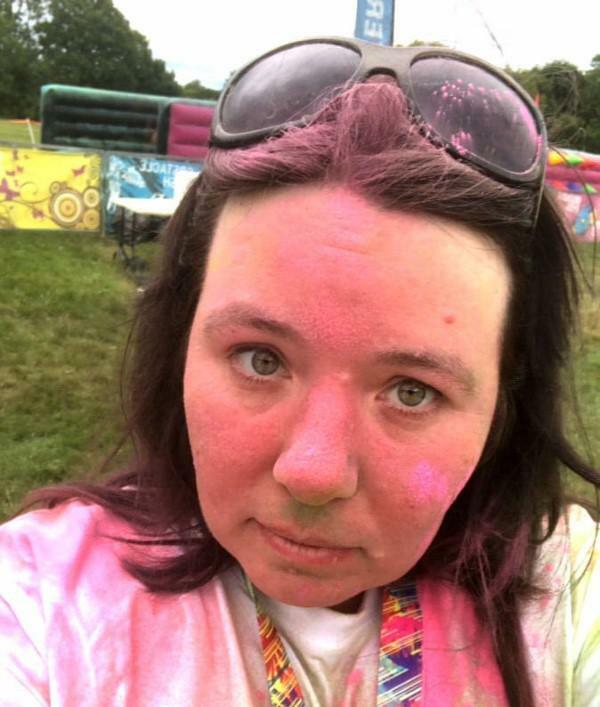 A paint-spattered but delighted Tina (pictured) said this week: “We are all over the moon and more than a little overwhelmed by the generosity of people who have supported us”. Footnote: Sunday may have seen the Drew’s Crew team nursing aches and pains, bruises and friction burns but it has not deterred them from agreeing to run the course again next year when they will be joined by Tina’s son and daughter and several of their friends.